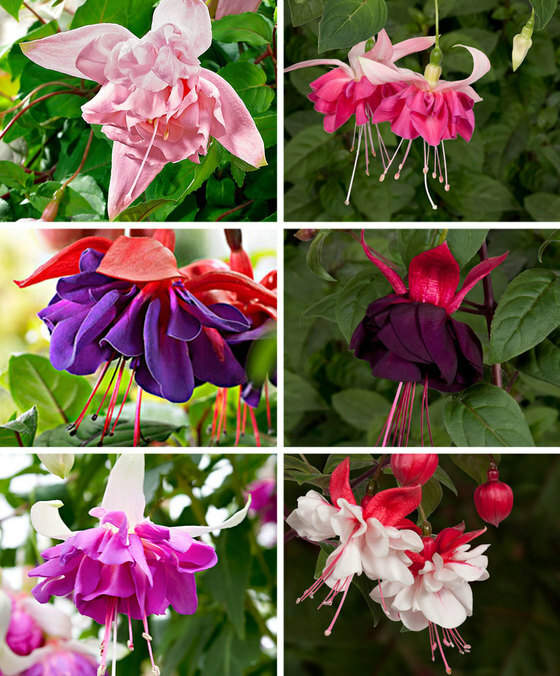 Giant Fuchsia Collection - Guaranteed minimum of 4 different named varieties. Elegant and beautiful, fuchsias are a must-have for any gardener. This sensational giant flowering fuchsia collection is chosen from the very best varieties on the market to guarantee success and flowers all season long. We have specially chosen this beautiful range to give you the large most free flowering varieties. Some flowers may reach the size of a tea cup! Perfect for borders, pots & containers, they will provide structure and colour all summer long. These reliable garden performers will thrive in your garden, coming back with bigger and better displays each year, and in such a range of flower colours, flower shapes and habits. On arrival pot up into 9cm pots in a frost free environment for approx 6-8 weeks and there ready to plant out into your garden.